We would all like our work to be satisfying and meaningful. And to that end, there is an entire industry of books, life coaches, and assessments dedicated to helping people discover what they should really be doing. The dramatic story you read about the fellow who quits his job as an accountant to start a non-profit, however, can be a red herring. Such examples blind us to the enormous opportunity you may have smack in front of you—right now, today—to reshape your job and increase both your impact and your personal satisfaction. Indeed, the search for the perfect job that will finally fulfill us is something of an idol of our modern culture. It’s part of that quest for the “perfect whatever” (perfect apartment, perfect spouse, perfect city to live in, etc.) that will finally make you happy—and which almost never does once you get it. It may be helpful to carefully think about and list all of the main activities in your work. And also, to imagine things you could be doing, within your current job, that aren’t part of your role today. For example: A few years ago I found that I was spending way too much time on the processes and analysis that wrapped around my consulting and training work. I mean things like doing a tons of interviews, analyzing data, putting memos and slides together, fussing too much over the exact sequencing of a workshop, and so on. I realized that my clients could do most of these things perfectly well themselves—even better than me–and that after 30 years as a professional consultant I was no longer interested in doing them myself. This fell clearly in the lower-left “Eliminate” quadrant of the matrix. I was less overwhelmed, and spending fewer late nights getting written documents ready for a client meeting the next day. My sessions with my clients were more vibrant and engaging because by sticking less to a pre-written script I created more interaction and unleashed more creativity. Examples like this abound. Recently, for example, I coached a top sales executive who was spending two-thirds of his week in internal meetings and filling out reports instead of meeting with clients. He was frustrated and felt his talent was being wasted. 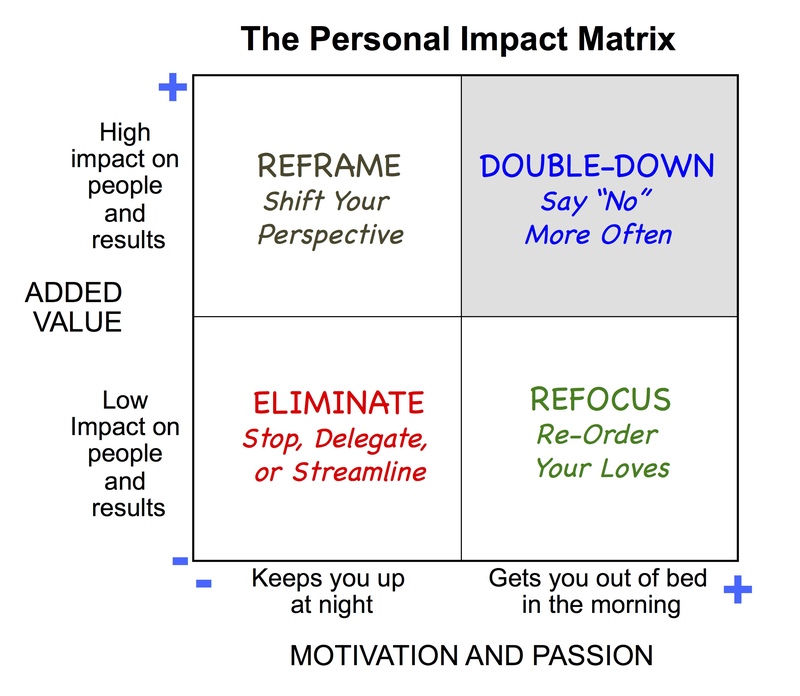 So take your own list of activities and position them on the Personal Impact Matrix. Delegate them to someone else? To quote the famous fourth-century monk and theologian, Augustin, you need to “re-order your loves” when you find yourself in this quadrant. You’re doing stuff you find enjoyable and interesting, but it’s not allowing you to have much impact. One of my clients ran a consulting firm whose growth had stalled and profitability was stagnant. He needed, as they say, to “work on the business” not “in the business.” He loved the nuts and bolts of reviewing market research reports and analyzing competitive data. But in truth, he had very bright staff who could do this extremely well themselves—at a much lower cost. As a result, instead of developing his thought leadership, marketing the company, and going out to speak with high-value prospects, he was pouring over excel spreadsheets. If you find it hard to let go of these “Refocus” quadrant activities, sober yourself up by thinking about how many days you have left on Earth. It’s a finite number—I guarantee you. Whether you believe that number is one thousand or ten thousand or twenty thousand days, ask yourself: Is continuing to spend time on these activities going to help me leave a legacy and really impact the people around me? 1. Strive for personal excellence rather than success as defined by other people’s metrics. For example, when I give a keynote speech, I have to ask myself, what is the definition of success? Is it that the CEO liked my speech and recommends me to another part of his company? If so, I’ll play to him or her and try and get them to like me. Is it high ratings on the evaluation forms? Well, that’s pretty superficial—the audience members might rate me very highly because I was entertaining, but then not change their behavior one bit! In that case I might tell more or funny stories and jokes. Is it long-term changes in behavior leading to improved business results over time? In that case I can hardly get excited about ratings sheets. Maybe the more people object to some of what I say, the more they will be engaged and reflective—and the more change that will occur. You see my point. 2. Focus on a successful outcome for your client, not perfection. There is such a thing as over-delivery. Remember, you’re trying to help your clients achieve their goals, not be perfect. Why write a 100-page report with color graphs if a ten-page one in black and white will get the same result (maybe better!)? Do you really need to interview 25 people for your project? Maybe 10 would suffice. In this quadrant, in the upper right, you’re doing work you are passionate about—it gets you out of bed in the morning—and you’re creating real value. It doesn’t get much better than this. It is in this quadrant where you eventually want most of your work to take place. As a successful person, you will constantly be tempted to dilute your focus. If you’re like me, you’ll come up with interesting ideas and you’ll want to pursue them all. Others will ask you to do things for them or with them. Your boss will pile more and more on your plate—much of which is not central to your Double Down quadrant. So stay focused on your sweet spot, and do more and more of the things you love to do at work and which allow you to add great value. In summary—the single idea in the title is this: Reflect on where you uniquely add value and identify what really gets you out of bed in the morning. Then focus like a laser on it. You don’t have to ditch your job to find more fulfillment and have greater impact. Spend some time on this exercise and you may be able to make a dramatic shift in 2015.